I sometimes get so frustrated with my human limitations. I know God is trying to whisper something into my spirit, and I get faint images of something important, but I am simply unable to connect the dots. That's the way I am feeling today about the latest reports on the Caliphate in Iraq. The British website, MailOnline, has chronicled the destruction of centuries-old relics and tombstones by ISIS, the militant Islamic group. 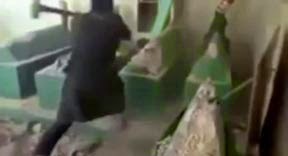 They [ISIS] say that they believe giving special veneration to tombs and relics is against the teachings of Islam. Yet one of the devastated tombstones belonged to the Prophet Jonah (Younis in Arabic) and was revered by Muslims and Christians alike, according to Iraqi authorities. I know, deep in my soul, that this has significance for us in these times. The prophet Jonah is important in Christianity, Judaism, and Islam. As Christians, we all know the story of Jonah being swallowed by the whale; in its belly for three days and nights, before being vomited up. This is a "type" of Christ's death, burial, and resurrection. In Islam, Jonah is highly important as a prophet who was faithful to God and delivered His messages. Jonah is the only one of the Twelve Minor Prophets of the Hebrew Bible to be mentioned by name in the Qur'an. Muhammed is reported as saying he and Jonah were brothers. "Jonah was a Prophet of God and I, too, am a Prophet of God." So, does the fact that this prophet plays a significant part in all three major religions, yet his tomb has been desecrated by a militant faction of one of them tell us anything about what forces are coming upon the earth? Are we aware of what our own Bible tells us about this man and this part of the world? I'm sure that many Christians are unaware that the life of Jonah can be traced to this very section of the world that is on fire today. You see, in Jonah's time, the city of Nineveh was extremely dark with sin in the eyes of God. When Jehovah told Jonah to go to that city and preach to the people of their wickedness, Jonah ran away, determining it was folly to think these people would ever repent. That's when his adventure in the belly of the whale took place. But that's not the end of Jonah's story. 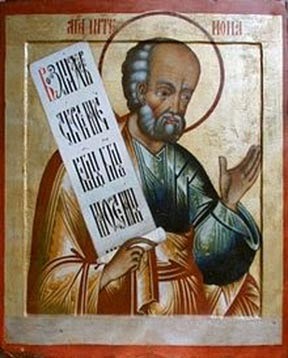 God delivers him from his disobedience and tells him once more to preach to the people of Nineveh. Jonah is to "tell the men of Nineveh that their wickedness has come up to God, and God’s vengeance is coming down upon them." This time, Jonah accepts his assignment and goes to "the great city of Nineveh." At that time (780-750 B.C. ), Nineveh was even larger than Babylon; taking Jonah at least three days to go through all the principal streets and lanes of the city to preach his message. At the present time, the ancient Nineveh's location is marked by excavations of five gates, parts of walls on four sides, and two large mounds. These ruins are across the river from the modern-day major city of Mosul, in the Nineveh Governorate of Iraq. But now, speaking of the latest attack against the ancient relics, Ninevah official Zuhair Al-Chalabi, told IraqiNews.com: "The elements of ISIS [have] controlled the mosque of the Prophet Younis (Jonah) in Mosul since they invaded the city." Does this sound like a group who reveres the prophets of their faith? And will the circumstances of today mirror the incidents of the Bible? As I try to figure out what God wants us to know through this turn of events, I can only see dimly through the glass ... wickedness has once more descended upon this area of the earth. Should those who are wreaking such death and destruction upon the land and the people expect God's reckoning, just as He warned over 2700 years ago? The Prophet Jonah's preaching resulted in nearly 120,000 residents of the ancient Nineveh who repented and were, thereby, spared God's vengeance. But this time, there is no Jonah, no message from Heaven, and no fasting and praying for forgiveness of sins; only Evil abounds. And, Satan, as if to prove his intentions, succeeds in seeing the saintly Prophet's tombstone destroyed. Through his minions, is Satan mocking the Jewish belief of Jonah's "desire for strict judgment", showing that he is not afraid of God's vengeance? Or, by way of a sledgehammer, is he, Satan, dealing a symbolic blow to the "son of Truth"? I'm not sure if, once again, by drawing our attention to modern day Nineveh and the Prophet Jonah, God wants us to know that wickedness is so abundant that His vengeance is coming soon. I wish I could discern His whispers more clearly. But the Enemy's message is obvious... anything holy is to be destroyed; and death and destruction will follow in his wake. Like the good people of ancient Nineveh, it will serve us to repent and pray that God will turn from His just anger and spare us; that the Evil that is rampant on the earth will not darken our door. Oh, how we desperately need a Jonah today! Jonah 3:8-9 "But let man and beast be covered with sackcloth, and cry mightily to God; yes, let every one turn from his evil way and from the violence that is in his hands. Who can tell if God will turn and relent, and turn away from His fierce anger, so that we may not perish?" The first thought that came to mind was, the devil knows his time is short and will soon be thrown into the abyss. If we take into account that the Christian faith is based on a connection with a Spiritual God, then emphasis should always be focused on relationship with an unseen Father. In other words the buildings, the temples, the shines of dead saints pale in significance when you realize that the God of all creation lives in your heart. Even the Prophet Jonah would be appalled at the thought that his remains have been honored in this way. Let the Christian idols fall anyway they can. I'm not advocating veneration or worship of tombs etc. Since the devil can't get to the Lord, he's going to go after anything or anyone that's represents Him in anyway. Even a tomb with dead man's bones! The NT refers to this three times: twice in Matthew, once in Luke, which all essentially the same content: Matthew 12:29 , Matthew 16:4 and Luke 11:29 And when the people were gathered thick together, he began to say, This is an evil generation: they seek a sign; and there shall no sign be given it, but the sign of Jonas the prophet.